I am excited that the feeling of spring is in the air. 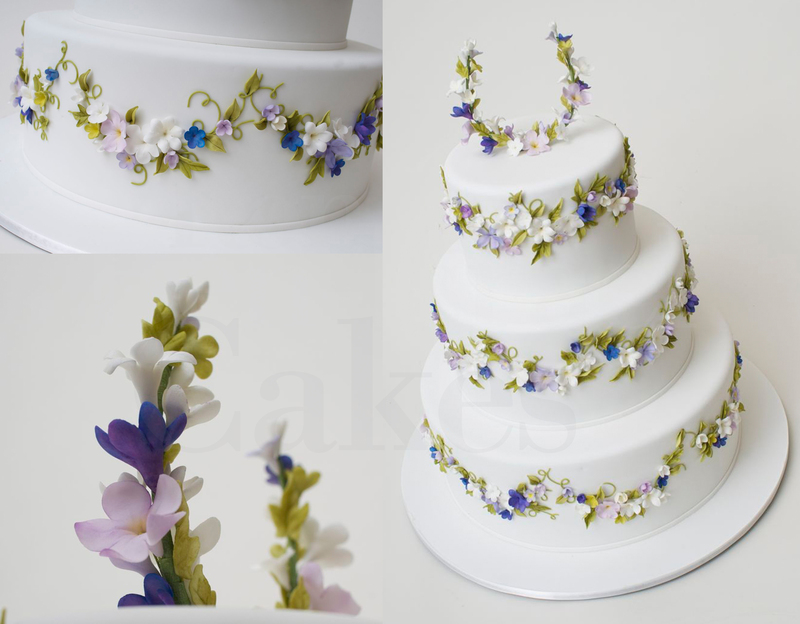 The cakes we are producing now are showing hints of bright colors and delicate floral surface designs. This was a cake we did last Friday for a wedding. It’s sweet and springy! Our confectionary artist, Sarah, created the vines with water, a steady hand and a "noodle" (made of sugar paste). Then applied the delicate sugar flowers to create the swag wreath around each tier. The finished cake. Many delicate sugar flowers were applied to create the wreath affect that around each tier. The topper was created with wired flowers. Such a gorgeous, gorgeous cake! Love the delicacy of it. I love the way Sarah did the vines. This is such a delicately lovely cake! Very lovely! Thank you for sharing a breath of Spring!